Hooray we are FINALLY in the summer term! Which means that the chances of us doing the school run in the rain have got to be slimmer? SURELY! So here are a few items I think look great when dashing out of the door at 8:39am on a Monday morning. Denim is the perfect thing to wear on the school run. 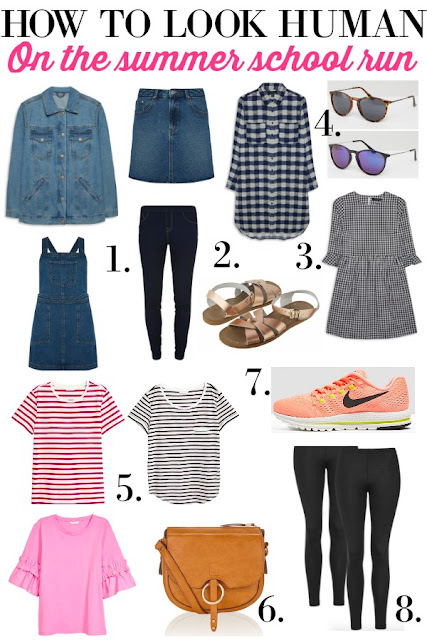 All of these items from Primark (1) not only look brilliant in the summer but you can keep them in your wardrobe and wear in the autumn with tights. I'm a huge fan of a denim skirt and am the proud owner of a few denim jackets which are easy to chuck on over anything. I recently bought these rose gold Salt Water sandals (2) for my holidays and they are dead comfy. They are quite expensive so you may want to search for some dupes. Shirt dresses are easy to throw on as they are pretty much like a nightie. Both of these are from Primark (3) and would look great with leggings or if you are feeling really brave? Get your legs out! ASOS do some great reasonably priced sunglasses like this double pack (4), which you can shove in your bag and don't mind if they get a bit wrecked. Stripes seem to form the basis of ALL of my school run wardrobe posts and these two t shirts from H&M (5) are perfect to go with a denim skirt or dungaree dress. I also really liked the pink top also from H&M with fancy sleeves which are really on trend at the moment. I have a thing for saddle bags and own loads of them but each year I end up buying a new one and my husband shouts at me. So this year I am eyeing this lovely tan one from Accessorize (6). I recently have become a trainer wearer. They give the impression you are slightly sporty and I adore this bright peach pair from Nike available on the Millets Sports website (7). Leggings are staples for any school run Mum and Top Shop do the best ones around. I love the longer length (8) and also keep my eye out for the shorter ones for when it gets that bit hotter. Which of course it will do. For around three days in July! So that's what I will be wearing. What will you?